2 Corinthians 13:11 (NIV) - Finally, brothers and sisters, rejoice! Strive for full restoration, encourage one another, be of one mind, live in peace. And the God of love and peace will be with you. - ABC Book: Paint the Night worksheet with a black watercolor. Let dry and glue white cotton balls on the moon and stars. 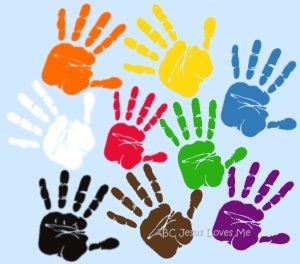 Handprint Wall - Add a black handprint to your color wall by painting the child's hand and stamping it onto a piece of paper. Write the name of the color on the handprint. Display it at the child's level to point and discuss the colors. 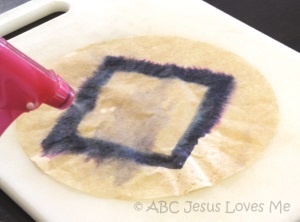 Coffee-Filter Shapes - Using a washable black marker, draw a thick-lined square on a coffee filter. Spray water on the filter which will cause the ink to bleed. Let dry. - Crumple up the Duck worksheet. Spread out and paint with black watercolor. - A duck says "quack." - Find pictures of ducks in the books that you read. - If available, go to a local lake or pond and feed the ducks. - Sign "bath" and discuss how the ducks get baths a lot. I specifically liked this sign as I could quietly tell our children "no" without others hearing. - Point and count the ducks in the illustrations. - As the book progresses, sing each verse in a "sadder" voice. Quack - move hand like a duck's beak saying "quack"